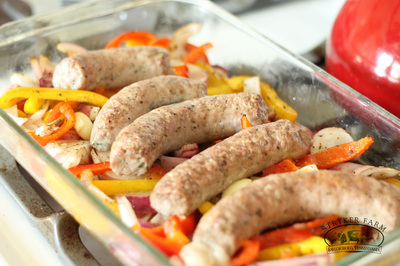 Baked sausage and vegetables is great for a weeknight meal. It's simple to prepare, and makes excellent next day omelette of frittata additions. 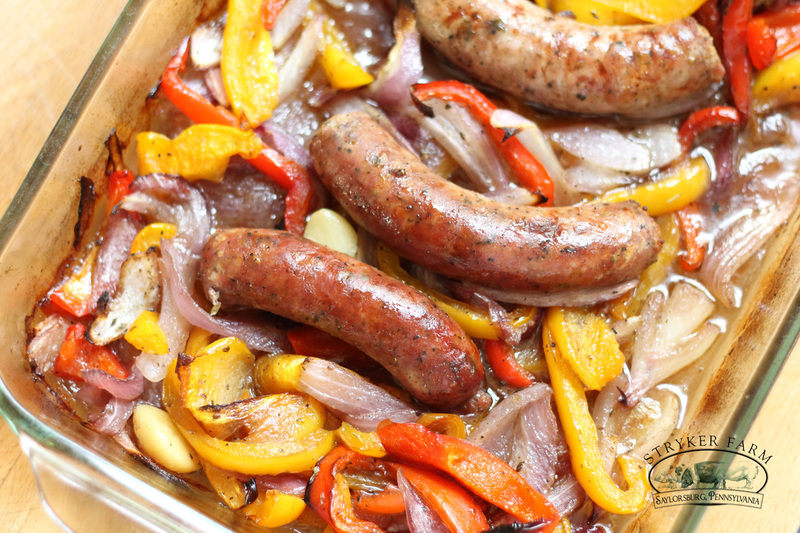 In a 9 x 13 roasting pan, add the sliced vegetables and garlic. Add about 2 TBSP of olive oil. Sprinkle in the dried spices. Mix it all up right in the pan. Cut up the sweet sausage into about 4 inch pieces. Nestle them within the vegetables. Pour in about a 1/2 cup of red wine. 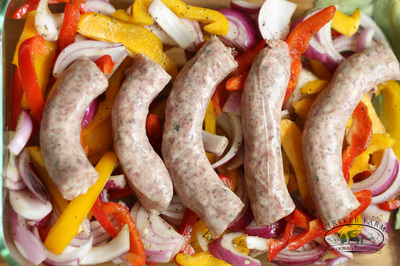 Place them in the oven. Set the timer for 20 minutes. At 20 minutes pull out the pan and toss everything together, a good stir and redistribution. Put it back in for another 30 minutes. Try to start the polenta 15 minutes before the sausage is finished. In a medium sized pot bring 2 cups of stock to a boil. 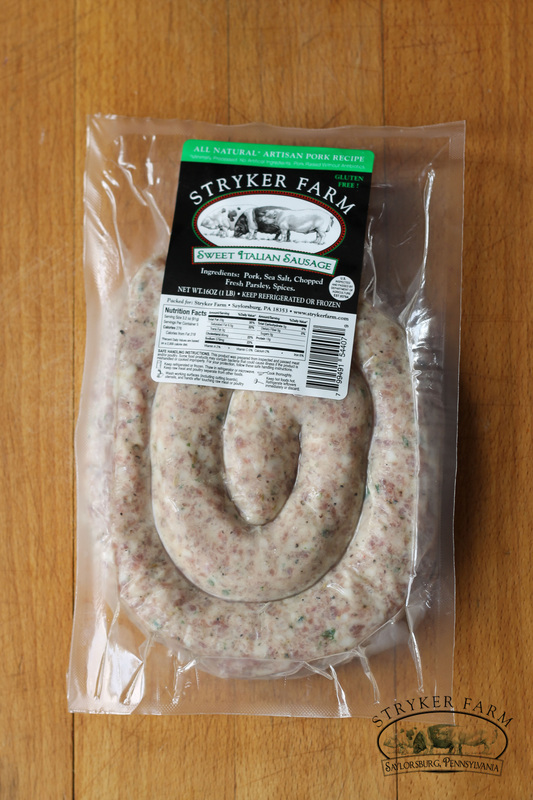 You could use a pork, chicken or vegetable stock. In a pinch you could use water, but it won’t be nearly as flavorful. 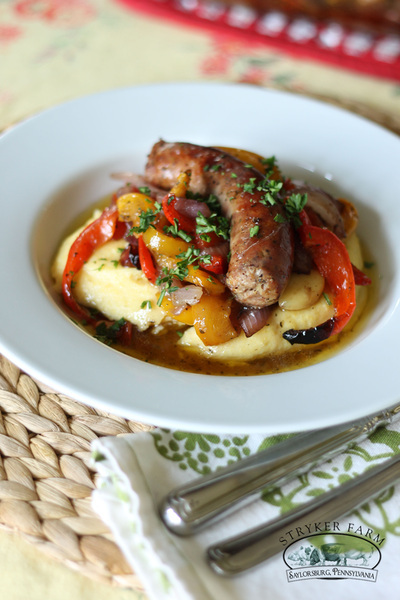 Polenta is best made, not with a recipe, but by sight. 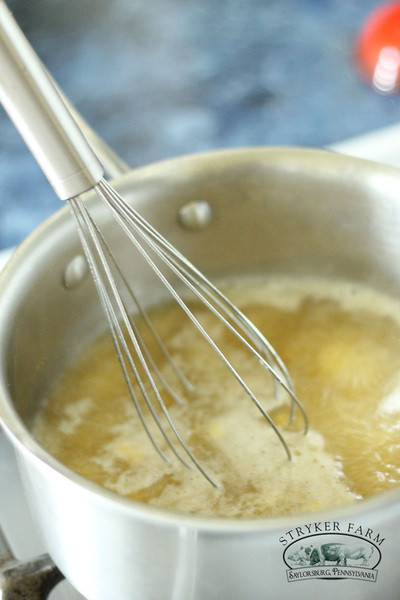 When the stock begins to boil, arm yourself with a whisk in your dominant hand and a bowlful of cornmeal in the other. 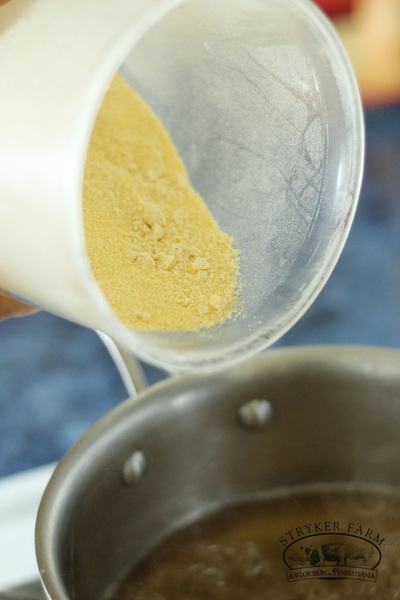 Gently and slowly, shake a bit of cornmeal at a time into the stock. 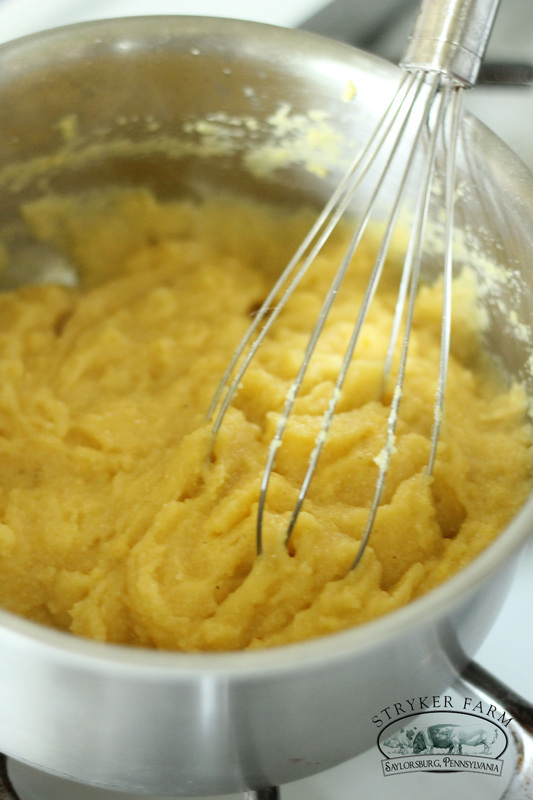 Use the whisk to stir in each bit of cornmeal. Add more when it’s dissolved. Keep stirring and adding more cornmeal until the consistency is thick like oatmeal. At this point turn off the heat. Add the butter, grated cheese, milk and salt and pepper to taste, stir with the whisk. The polenta should be a little stiffer now, like mashed potatoes. 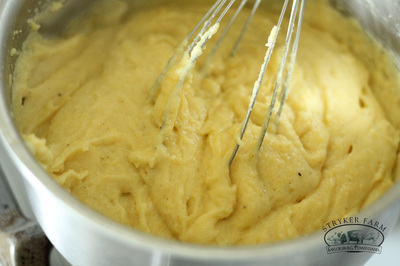 Knock all the sticky polenta off of the whisk because the longer you leave it in there, the harder it will be to clean. 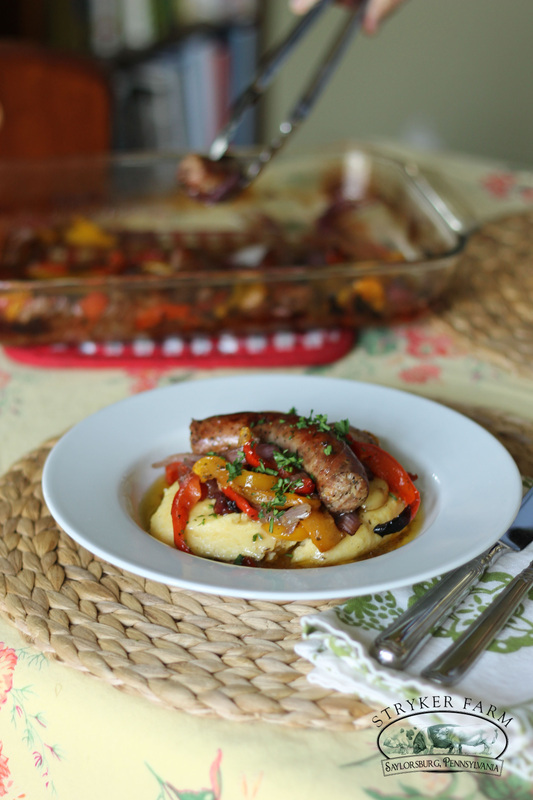 Ideally the baked sausage and vegetables will be ready to come out of the oven when the polenta is finished. Serve a scoop of the soft polenta into a bowl. I like to use a spoon to create a little well for the pan juices. Top with vegetables and sausage. 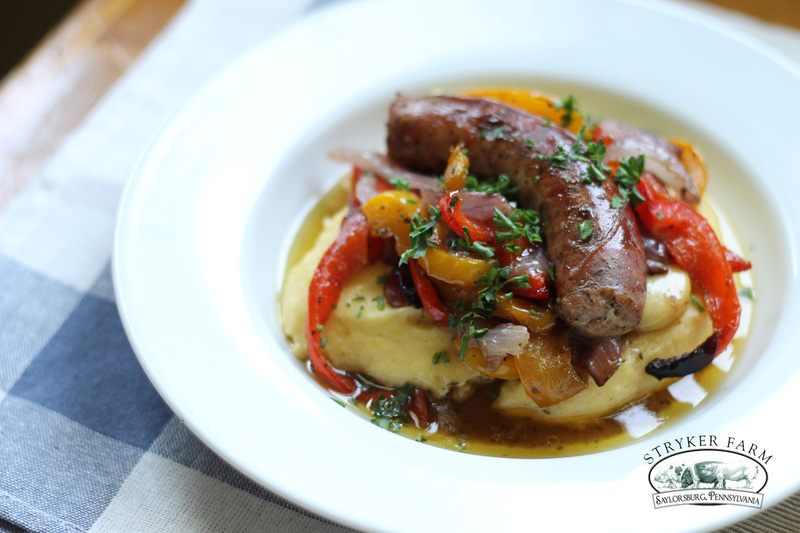 Garnish with chopped parsley for color and flavor. 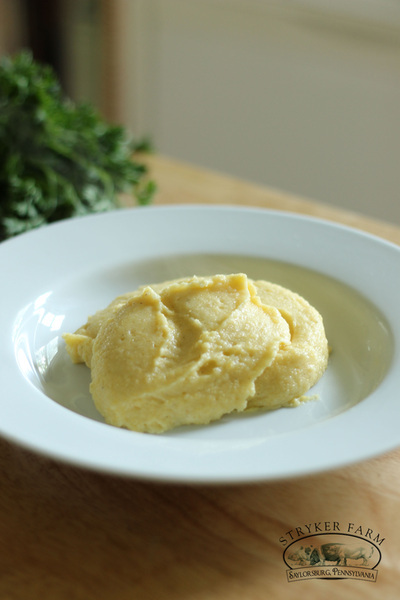 If you have leftover polenta spread it out in a container and store it in the fridge. 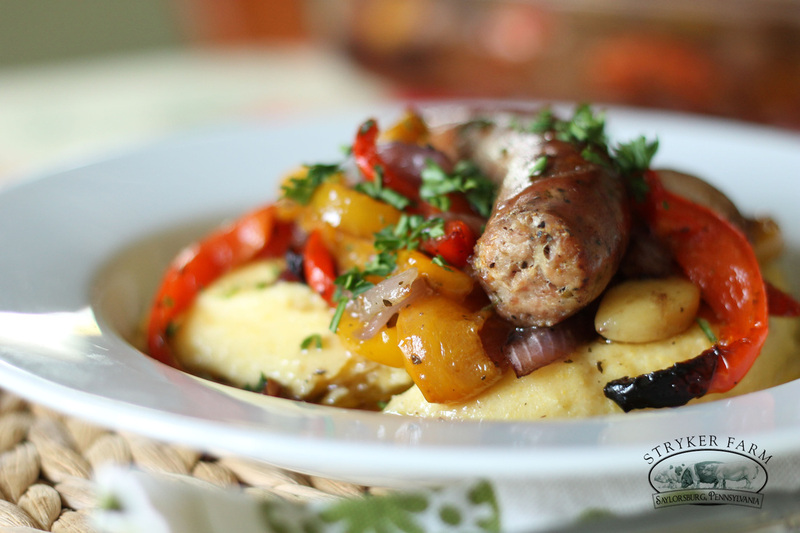 When you're ready to use it again slice slabs of the polenta and pan fry it.